Wiley Metal is a third generation metal fabrication company that calls Indiana home. Our Midwestern ethics and attitude play a big part of who we are. Wiley metal was started in 1982 by Verne Wiley, who had years of experience in the steel fabrication business. He was shortly joined by sons’ Ed and Rob, who now serve as the company’s president and vice president. They have since been joined by Ed’s sons Mike and Ben. The company has not only been fortunate to have a terrific and loyal customer base, but they have also been honored through the years with numerous awards. In 2012, they were recognized by Wabash National Corporation with their Platinum Award. The award was given for Wiley Metal’s excellence in supply chain performance delivery, quality, cost and innovation. The organization continues to win awards annually. Wiley Metal is an OEM supplier and a strong supporter of Manufacturing Day, an annual event that celebrates manufacturing in the United States. They take pride in creating manufacturing jobs in their county and state, and are pleased to be an impetus in rebuilding a strong manufacturing base in this country. Ed and Rob enjoy a cold beer and the occasional round of golf. 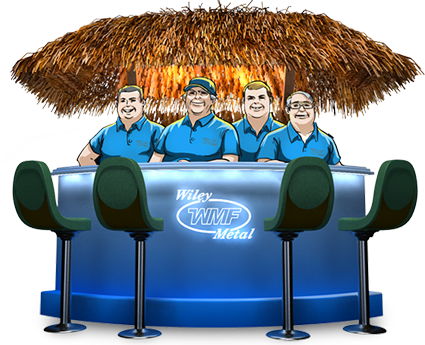 The company had fun building an entire Tiki Bar out of scrap metal and that has led to the name of their blog being called “Tiki Talk”. You are invited to attend! Should you have any questions about Wiley Metal, its capabilities or its particular products, please contact us. There are exciting times ahead for Wiley Metal, and we would love for you to be a part of it! Say hello to the rest of team!